bopuc/weblog: The precedent is set, the case law is clear. Round up the perpetrators and prosecute. The precedent is set, the case law is clear. Round up the perpetrators and prosecute. 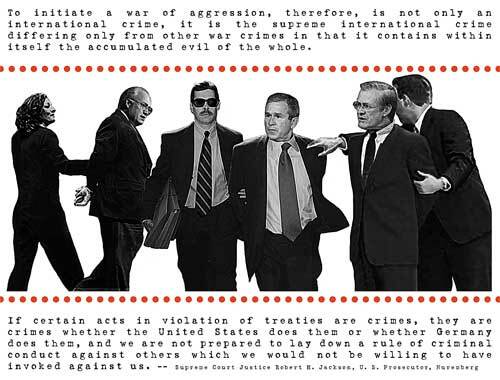 To initiate a war of aggression, therefore, is not only an international crime, it is the supreme international crime differing only from other war crimes in that it contains within itself the accumulated evil of the whole. - Supreme Court Justice Robert Jackson, U.S. Prosecutor, Nuremburg 1945-6 WWII Nazi War Criminal Trials.